two things stand out when i remember my dad. he was a foodie before the word was ever uttered and he may have been more impatient than i am. not one to join the queue unless he absolutely had to, saturdays would find us at chino farms vegetable shop waiting in a long line to buy the most incredible just-picked fruits and vegetables. it's no wonder they count alice waters and wolfgang puck as clients. on a street buffered with mansions in rancho santa fe lies this unassuming family-run stand with acres and acres of fields of green and history behind it. everything just pops with color and beauty at chino's. i swear i could live there. the ultimate in produce, so fresh and lovely you feel like you could dive in with mouth wide open. with an amazing assortment of things you recognize sitting next to "wow, what's this beautiful goodie?" chino's makes shopping an experience for the senses. and the corn! their white corn is so sweet and crunchy my dad and i would eat a piece raw on the drive home. i've never had better and i can bet you'd say the same. picked that morning you must eat it that day, not that it goes bad quickly but for the ultimate in freshness? plan your dinner around your chino farms visit. after we would get back from one of our shopping trips, my dad would drag a trash bin outside and give us kids the ears and we would shuck away salivating in anticipation of that first bite! now that i'm a couple hours' drive away i insist on stopping on my way back up the coast, a bit out of the way, each and every time i go visit family there. i brought some corn back to my angels at the office my last trip down with my admonition that they had to eat it that night! katie and her husband had it cafe habana style while tyler did her best ina garten impression with a yummy corn salad. that being said, you can't go wrong with butter, salt and pepper. pass the corn, please. 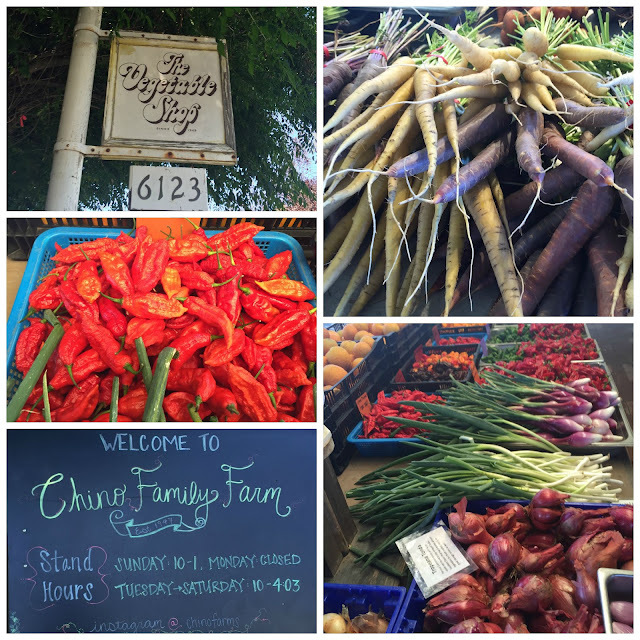 this vegetable stand earned a spot in zagat! and that pretty much says it all. "when only using the best, most perfect produce with do", this "ultimate roadside farm stand" in rancho sante fe is a "true treasure", drawing "celebrity chefs" and "the public" alike for its seasonal fruits, veggies, and herbs (both the "staples" and "new favorites"); while "prices are on the high end", devotees insist "you can't get fresher or higher quality anywhere." thanks to katie's husband, taylor, for the recipe. here's to hoping a trip to chino's will inspire your labor day recipes! - stir together the mayonnaise, salt, garlic and cayenne in a small bowl. - heat the grill to medium high heat. 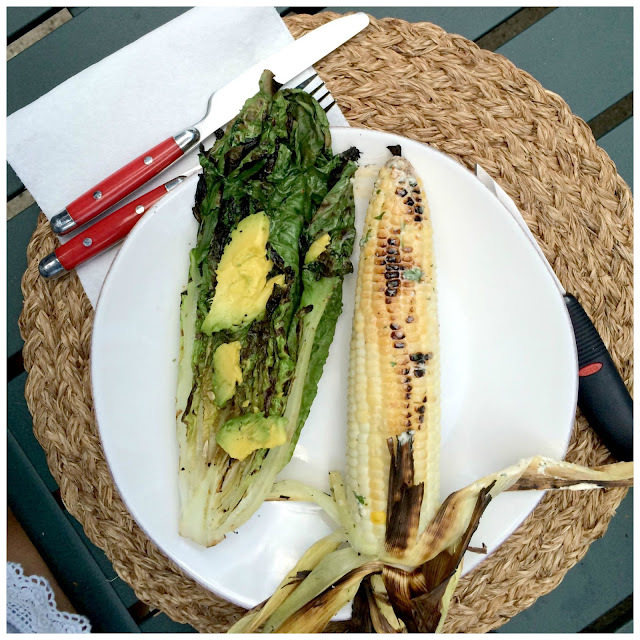 before placing corn on the grill, peel the husks back and remove as much of the silk as possible, then peel the husks back up around the corn. - place the corn on the grill and close the lid. roll the corn a quarter turn every 5 minutes or so. cook until the husks are charred and when peeled back, the kernels pierce easily with a knife. - remove the corn from the grill and let cool slightly. peel pack the husks so that they form a handle, and spread the garlic mayonnaise mixture onto the grilled corn. sprinkle with cotija cheese and a squeeze of lime juice and dig in!